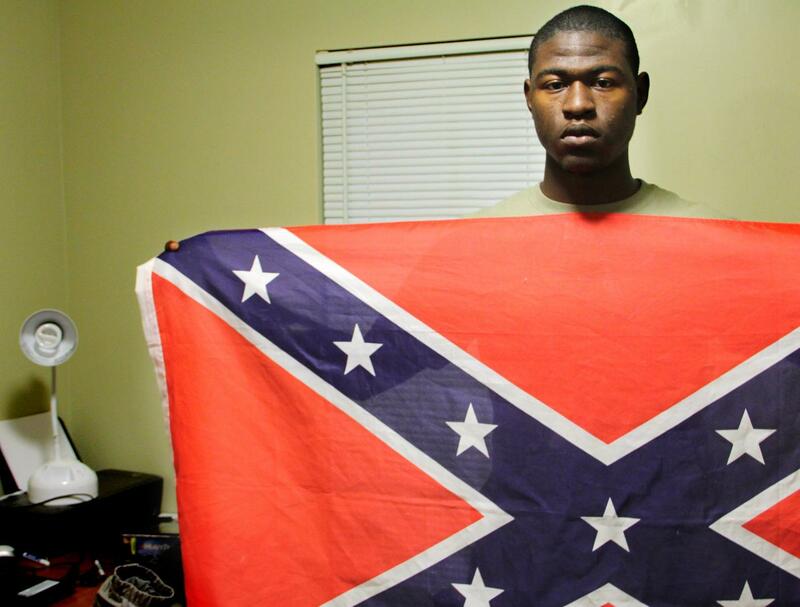 COLUMBIA, S.C. (AP) — A black college student who drew complaints for displaying a Confederate flag in his dorm room window said he sees the banner as a symbol of Southern pride and not racism. The 19-year-old student at the University of South Carolina Beaufort took the flag down at the university's request, but he said he's considering putting it back up after the officials relented. Byron Thomas has drawn nearly 70,000 views since he posted a video online in which he acknowledges: "I know it's kind of weird because I'm black." In a telephone interview Thursday, Thomas said a class research project made him come to the belief that the flag's real meaning has been hijacked. He said he wants people to thoughtfully consider issues of race and not just knee-jerk reactions to such symbols. "When I look at this flag, I don't see racism. I see respect, Southern pride," he said. "This flag was seen as a communication symbol" during the Civil War. The freshman from North Augusta said his generation can eliminate the flag's negative power by adopting the banner as a symbol of Southern pride. "I've been getting a lot of support from people. My generation is interested in freedom of speech," Thomas said. But Thomas says his parents don't like the flag and he's concerned about their point of view, particularly since they pay his bills. "I don't want to make my parents mad," he said. "I may wait until Monday to put it up." He said he's unhappy about such things as labels, and he doesn't like the term "African-American," which makes him feel like "a half-citizen," since he wasn't born in Africa. Thomas' roommate Blane Reed, who is white, said in a separate telephone interview that he never heard any complaints after Thomas put the flag up shortly after Labor Day. Each student has a separate bedroom and share living space with three others, the 18-year-old from Walhalla, S.C., said. He said the flag was on the inside of Thomas' bedroom window and moved it later to the window in their common living area. But the week before Thanksgiving, Thomas was asked by his hall director to take it down from the window and put it anywhere inside the student apartment. Thomas then posted a video on CNN's iReport website that has logged more than 69,000 viewings. An article in The Beaufort Gazette Thursday touched off dozens of comments, both pro and con. "I think he's got a really good point. It's just a flag, and in and of itself, it doesn't have any racial meaning. It only has as much meaning as you put into it," said Reed. He described his roommate as a hardworking student who attends church services regularly and hasn't let the incident interfere with his studies. "Byron is really smart, very outgoing. He's one of the nicest people you would ever meet and he'd give you the shirt off his back," said Reed, a biology major. University spokeswoman Candace Brasseur said Thursday in an email that about two-dozen students had raised the issue of the flag with the housing office or with a resident adviser. On Thursday, she forwarded an email the school had sent to its students and staff, informing them that officials had asked Thomas to remove the flag "out of respect for his fellow students' concerns." However, the e-mail added, because of "USCB's firm belief in the First Amendment and its right of free speech, the University cannot and will not prohibit these flags or other symbols that our students choose to display." I applaud him for taking what he learned and forming his own opinion. That flag reminds us of an ugly time and a segment of the nation that was in favor of slavey. But is that all the confederacy meant? Personally, I do not have the interest to dig further into it,but if this student has and drawn his own conclusion, good for him. I can think of a lot of things that represent Southern Pride and the Confederate flag doesn't make the list. I also think his view are contradictory. He doesn't like the term African-American because it implies he is only half American but his symbol of Southern Pride was actually the battle flag for people who did not want to be Americans anymore. If they had had their way, this young man wouldn't be an American. As far as the flag being a symbol of hate. I don't think the original Confederacy necessarily meant it as such... But as GRITS, I know my history well enough to know it has been used that way. SC, GA and MS all put versions of the Confederate flag on their state flags in protest of forced integration, and the Brown v. Board of Education decisions. I guess he's entitled to see it as he pleases but for so many of us who have had family members terrorized by the Klan, it's a symbol of hatred and fear. Hopefully that he will allow his mind to be exposed to the history of the life that his fore-parents endured to make his Southern heritage and the price they paid without compensation for that Southern pride he and all that love the flag says they see and he'll come to a rational realistic conclusion about what it really means. Otherwise, let's say hello to the next Clarence Thomas, Herman Cain, and the other unenlightened folks being used as spoken tokens.